Eleven prominent YouTube content creators just met one of the most important people in the world. 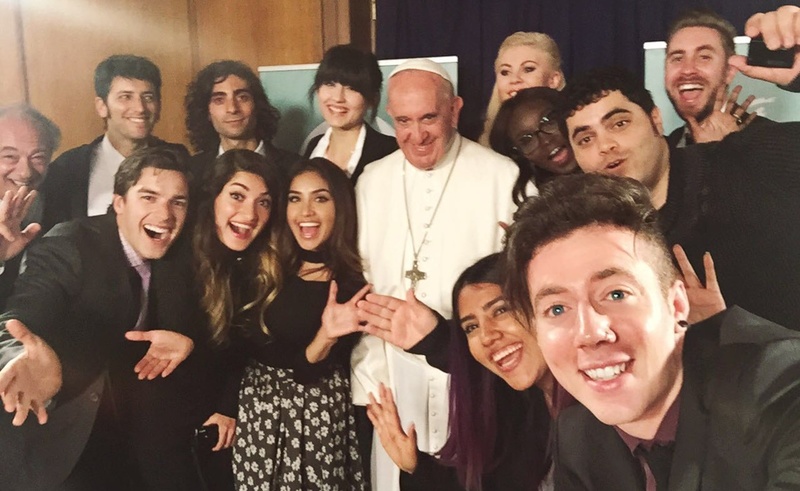 During the Scholas World Congress in the Vatican, social media stars hailing from 10 different countries all met Pope Francis, who hosted his guests for a conversation about promoting diversity. As was the case for the YouTube creators who got a chance to speak at the United Nations, the video-making community’s Papal visitors are an international bunch. Here’s the list, according to a press release from YouTube: Hayla Ghazal (United Arab Emirates, 1M subs), Dulce Candy (United States, 2.4M subs), Matthew Patrick (United States, 6.3M subs), Louise Pentland (United Kingdom, 2.4M subs), Lucas Castel (Argentina,1.9M subs), Matemática Río (Brazil, 330K subs), Jamie and Nikki (two YouTubers from Australia and Africa, 660K subs), Greta Menchi (Italy, 815K subs), Los Polinesios (Mexico, 11M subs) and anna RF (Israel, 69K subs). In meeting a handful of the most popular personalities on the Internet, Pope Francis opened up new avenues on which he can spread his message of tolerance and understanding. He urged the creators who visited him to discuss the topics they are most passionate about, ranging from immigration to gender equality. “I think I speak for everyone when I say how exciting it is to see such a major world leader take interest in the power of new media to create positive social change,” said Matthew Patrick in a press release. “It’s something we all believe in, so to have more traditional bodies take notice of the work we’re doing and be interested to learn more is incredibly validating”. Video of the meeting between the Pope and his YouTuber guests is available via anna RF’s YouTube channel. Additional information can be found in a blog post authored by YouTube.